Richard Baer, Dr. Josef Mengele, and Rudolf Höss. 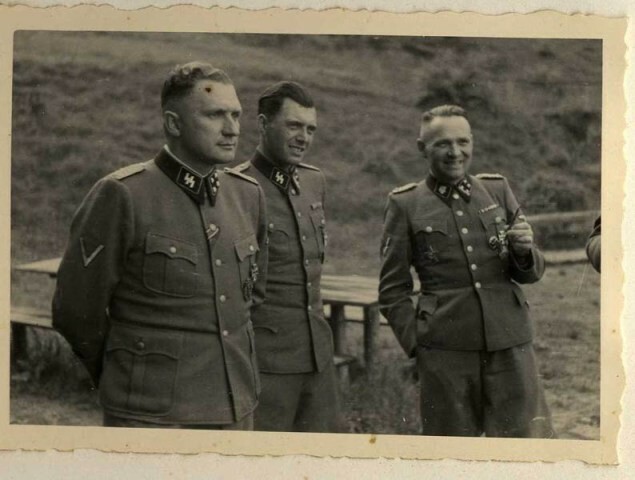 From Karl Höcker's photograph album, which includes both documentation of official visits and ceremonies at Auschwitz as well as more personal photographs depicting the many social activities that he and other members of the Auschwitz camp staff enjoyed. These rare images show Nazis singing, hunting, and even trimming a Christmas tree. They provide a chilling contrast to the photographs of thousands of Hungarian Jews deported to Auschwitz at the same time.